Carbonate structures at a hydrothermal vent in the ocean today include these spires stretching 90 feet tall. The white, sinuous spine is freshly deposited carbonate material. Looking for fossils in old rocks is a tough job. Body partsdegrade over the years, and the older the rock, the less likely it will be thatyou will find any evidence that life was once there. One question facingscientists is: Just how far back in time can we go before the traces of lifeare completely lost? A new study provides one answer to that question, and indoing so suggests the limits to looking for ancient life not only on Earth, butalso on other rocky worlds like Mars. The study, conducted by DanielBrigel of the University of Bremen in Germany and colleagues and published inthe July issue of the journal Geology, determined that 300million-year-old limestone deposits in Namibia were formed by a community of ancientmicrobes. Methane-eatingmicrobes known as methanotrophic archaea caused the formation of mineralsthat led to the limestone, and alongside the archaea were sulfate-reducingbacteria that aided in processing methane. The researchers found evidence that the methanotrophic andsulfate-reducing organisms were present by searching for unique biomarkers in thelimestone. These biomarkers are lipid compounds with names like archaeol, crocetaneand pentamethylicosane (PMI). These lipids are made by living cells to formimportant structures like cell membranes. Usually, after a cell dies, the lipids are degraded and usedby other organisms. However, the organisms that produced the lipids found in Namibia also produced the minerals that make up the limestone. 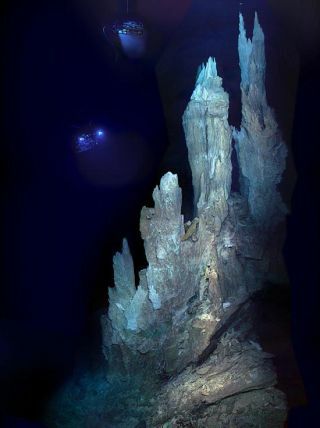 As the microbes producedminerals called carbonate, the limestone rock formed and engulfed the cells.When the organisms died, their cells' lipids were protected inside thelimestone. Lipid compounds like those found in the Namibian rocks canindicate that microbes use methane but not oxygen. The problem with thecompound archaeol, however, is that it is easily broken down and oftendisappears over long periods of time. Crocetane and PMI are more durable, andare more likely to survive over geological time scales. Because of this,crocetane and PMI in particular are the best indicators in ancient rocks ofmethane being processed in the absence of oxygen. Biomarkers from microorganisms have been identified beforein limestones from the Cenozoic period (65 million years ago to the presentday). PMI and crocetane also have been found in Mesozoic limestones (248 to 65million years ago) in places like California. The limestone from Namibia dates back to the Paleozoic era, which lasted from 542 to 251 million years ago. Theteam found that if the lipids were any more degraded, they wouldn't beidentifiable. This means that lipid biomarkers probably wouldn't be found inrocks older than the Paleozoic era. The authors of this study say that the processing of methanewithout oxygen is "the key metabolism at modern marine methane seeps"on Earth today. This important metabolic process produces carbonates that formstructures around methaneseeps in the ocean. The microbes involved in modern methane processing in theseenvironments are the same types that were present in the ancient Namibianrocks. According to the research team, "In this study weprovide robust biomarker and isotope evidence that methane was oxidized in thesame manner in the Paleozoic as it is at modern marine seeps today. "Additionally, the methods they used to study the rocks highlight "thepotential of lipid biomarkers to unravel past microbial activity andbiogeochemical cycles." This can help us understand how ancient microbeson Earth affected the planet's environment. Using biomarkers to uncover information about past life onour planet is important for determining how the biosphere of Earth has evolvedalongside our ever-changing planet. The rocks that remain from ancient timescontain numerous clues about our planet's past climate and life. Developing techniques to search for biomarkers from ancientorganisms on Earth can also help us determine ways to search for signs of pastlife on other planets, such as Mars.Future missions to Mars will examine rocks, looking for the molecular remnantsof ancient living organisms. It is thought that such organisms may have lived on Mars 3.5billion years ago, when the planet was warmer than it is today, and there werelakes and perhaps even oceans on the surface. It will be difficult to findfossils after all those eons, so biomarker studies may be the best way forexplorers to determine whether or not Mars ever had life of its own.